I accidentally stumbled upon the best blender years ago, and would love to tell you about it. People are always asking me to share the secret to my success as a long-term vegan and lover of whole foods. A fantastic and powerful blender sits right on my kitchen counter top and is used on a daily basis. That's crazy, Sass. A blender? The key to success on a vegan diet? This miracle machine is called a Vitamix. But it isn't always super easy to stick to your decision to go dairy-free. Well, your food may seem boring, you might find that you miss the consistency and flavors of those dairy-based foods, or your family may feel they're missing the fun flavors they're used to. And last but not least, you want to feel that sense of accomplishment that can only come when you stay true to your word and stick to your healthy diet for a lifetime. In 1994, I shifted my focus from burgers, greasy fries and chocolate milkshakes to vegetable-, bean-, and grain-based dishes. My reasons for this change were due to my desire to go vegan. Of course, you don't have to be a vegan like me to find success with your dairy-free diet. Firstly, you try your hardest to find a replacement for your ol' love, dairy cheese. This usually involves various dairy-free cheeses, such as soy cheese, rice cheese or almond cheese. When you find a dairy-free cheese you like, you tend to go overboard and use it much more than you should for your good health. But guess what I've discovered? it's simply the comforting creaminess. So what you need are not faux cheeses to fill the place of your dairy cheese. not going to add inches to your waistline, but in fact, might actually help you to lose weight. 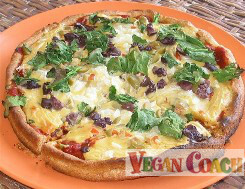 For example, if you want a dairy-free pizza with cheese, you can order (or make) a pizza with dairy-free cheese. But the challenge is that most dairy-free cheeses don't taste very good, or they aren't actually dairy-free (contains casein), or they're fattening! When the pizza mood strikes in our home, I head straight to my kitchen to whip up my own cheesy sauce that's delicious and comforting and everything you could want a pizza to be. I have found these dairy-free sauces to be THE KEY to a successful dairy-free diet. In fact, I wrote a book (Get Sauced With Sass! 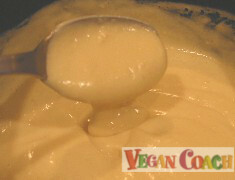 -- available on my website) about how to make your own dairy-free sauces from scratch using healthy ingredients. And it's all been made possible with my beloved Vitamix. Click here to learn more about the Vitamix package I recommend. It has everything you need (and then some!) at a great price. Plus, we have a special offer for you: FREE SHIPPING! Hubby Jeff and I purchased our Vitamix back in 1997 after watching a demonstration of its many uses at a Health Fair in Las Vegas. Since we were fairly new to dairy-free eating at the time, we weren't exactly sure how important this little appliance would be to our success. Nor did we realize that we had just found the MOST amazing addition to our kitchen -- without even trying! So, you may be thinking, what's so amazing and special about a BLENDER? This is NOT your average blender. Over the years, we've enjoyed dairy-free meals that we absolutely love. And the KEY to these meals is the creation of homemade creamy and delicious dairy-free sauces, dips and dressings made with healthy ingredients like nuts, seeds, beans and whole grains. But if you've ever tried to use a regular blender with ingredients like these, you were likely not happy with the end result. A regular blender just doesn't have the power these ingredients need to be transformed into super creamy sauces, dips and dressings. You need a strong blender to do the job. The Vitamix has such an incredible range of motor speeds (11mph to 240 mph). You can grind those tough ingredients into smooth and delectable sauce-like creations easily. For instance, the creamy sauce in the photo above was made with cashews filled with healthy fats you need. The pizza slice was covered with a delicious cheesy white sauce made with calcium- and fiber-rich white beans. Don't these sauces look appetizing? They are! Smooth sauces mean delicious results that will make you excited about cooking again! In fact, you'll actually want to eat at home more often. Imagine how much healthier you'll be if you reduce the number of times you eat unhealthy and fattening restaurant foods, and replace them with foods which are good for you. Add creamy sauces, dips, and dressings to your diet. You'll be completely amazed at how easy it is to stick to your dairy-free guns. "I am enjoying my Vita-Mix. My daughter confessed to "blender-envy" so she got a Vita-Mix as a Mother's Day gift." There you are, minding your own business and suddenly it strikes you - the need for a bowl of ice cream or a thick and creamy shake. You cannot sit still until you answer the call of dessert! So you head to your freezer (or the store) to pick up a pint of your favorite non-dairy ice cream and scarf it down in no time at all. Usually, guilt sets in. "Darn it, why did I cave in and eat that?" You can almost FEEL the fat settling into your hips, thighs and buttocks. And you also know that this will mean an extra 30 minutes added to your workout routine. Plus you'll likely notice a negative change to your complexion. Yuck! Damn the ice cream temptations! There is absolutely no need to put yourself through this pain and agony. Instead, you can put ingredients such as non-dairy milk and fruit, along with ice, into your Vitamix and within 1 minute you will have your very own additive- and preservative-free (and even soy-free, if desired) ice cream treats. One of my personal favorites is made with cashews, dates, cocoa, vanilla (and more natural ingredients), a little ice and voila (! 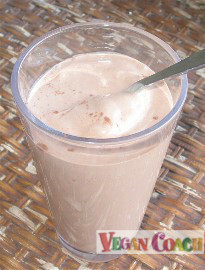 ), a creamy, thick and deeeelicious chocolate shake - chock full of the healthy fats your body needs. These homemade ice cream concoctions not only help you to stay away from the unhealthy pre-packaged stuff, but because they're made with HEALTHY INGREDIENTS, eating these treats can actually make you look and feel better, and give you a more radiant complexion. Talk about a healthy eating plan! That's the kind of dessert I want to eat, how about you? If you're striving to eat healthy, you've discovered the importance of whole grains. And if you do any baking, you know that the best flour to use is whole grain flour. So you buy a bunch of flour at the store, and keep it around for when you're ready to do some baking. Because it's healthier to grind your whole grains (and seeds too) just before eating. 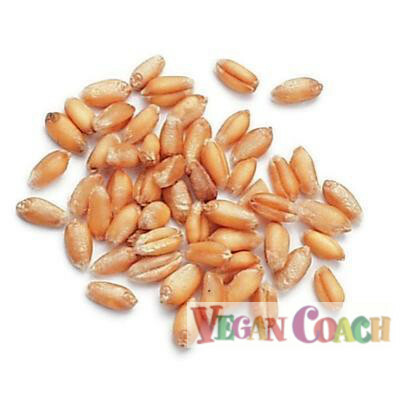 Just after you break open that outer wall of the whole grain, the nutrients become fresh and available. But those once-precious nutrients begin deteriorating in a very short time, and soon you're left with a sad pile of ground-up grains that are simply not offering you the utmost in nutrition. 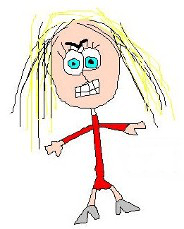 Why take up any room in your tummy eating foods which do not offer you the nutrients your body needs? Instead, grind your whole grains just before you eat them. The Vitamix offers an additional container (called a Dry Container), which has a special blade that is made specifically to grind whole grains to perfect flour, time and time again. "I've had my Vitamix now for several years. I've done everything from kneading bread dough, to making sauces, soups, desserts, smoothies and even used it as a food processor. It came with a book that shows you how to do everything you want to do, EVEN GRINDING GRAIN. "It was the best investment I've ever made as well as introducing a MUCH HEALTHIER diet to my family." Weight gain from apple juice? You probably know that eating an apple is more healthful than simply drinking the juice from the apple. When you eat an apple, the fiber remains intact. However, when you juice an apple, the fiber is taken away and you're left with juice which is packed with sugars - sugars which can overwhelm your body processes and cause a fluctuation in your blood sugar. This can make you tired and can actually cause weight gain! And I don't even have to mention this point to those with blood sugar challenges, who turn their back on fruit juices for this very specific reason. Fiber is the key to keeping your blood sugar under control. 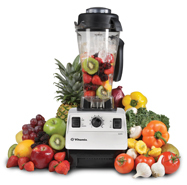 The Vitamix processes fruits and veggies into juices and smoothies (and even applesauce) in just 60 seconds. Fiber ensures slower digestion, so your blood sugar will be more even - no more ups and downs! And best of all, you'll pack your body with the healthful nutrients which fruits and veggies supply -- 2 of the major food groups that you need. "My mom is enjoying her Vitamix very much. She texts me regularly to update me with what she's whipping up. It's so great!" Q. "For dry chopping and mincing vegetables such as onions, potatoes, and carrots with the Vitamix, which container would be best to use, the dry or wet blade container?" A. You can use the Vitamix for mincing. The way to do this is to add the veggies to the Wet container (meaning not the Dry one) and add water to cover. Then blend on low-medium for a few seconds until the veggies are minced to your liking. Then drain the veggies in a colander. If you need your veggies to be fairly dry, then you can lay them out (such as on a towel or paper towel). One of the coolest features of the Vitamix is that it's self cleaning. Fill it with 4-5 cups of hot tap water, add a dash of liquid dish detergent, set the Vitamix on its highest setting, and in 30 seconds your container is ready to be rinsed and drip dried. Speaking from experience, I can say it's SO helpful for your Vitamix to clean itself in the background while you finish cleaning the rest of your kitchen. You'll be in and out of the kitchen faster so you can continue with your day. "I love the VitaMix and use it multiple times a day, every day. Green smoothies have changed the way I feel and eat. I can also process as much garlic as I crave without handling it so much that my hands stink for a week. Homemade non-dairy ice cream is a favorite treat." "I also purchased the grain blender and have been making whole grain baked goods with a variety of different freshly ground grains. I love the blender, and your work. Please keep it up, thanks for all you do." These are two of the top reasons you need a Vitamix in your kitchen. In fact, once it resides on your kitchen countertop, you'll wonder how you ever lived without it. This all-in-one magic machine is such a workhorse, and it takes up very little room on your kitchen countertop giving you more room to work your cooking magic. This is important to me because I have a small kitchen. I need every bit of space I can get. "My Vitamix is my absolute favorite appliance in the house. In fact, I took my coffee maker off the counter and now have my Vitamix in its place. Only the most used appliances are allowed on the counter is my rule. I use it almost EVERY DAY. Yes it is expensive, but I was wearing blenders out left and right making my smoothies. This one is definitely worth the cost." Most companies offer a warranty, but if you look closely at the fine print, you'll find something that goes like this: "...warranty does not cover the following, which may be supplied with this product: parts, containers, fittings, blades, lids, agitators, etc." Of course, you probably know by now that Vitamix offers MUCH MORE. They guarantee that your Vitamix machine (for normal household use) will perform like new for a full seven years from the date of purchase-or they will fix or repair it for FREE. But you will likely NEVER have to take advantage of this warranty because they make such a faaaantastic product. Truly! You will be completely blown away at how well this machine is made. It's mind boggling. "We are a family with seven children! (really only 4 are at home now, there are 3 married, and one has her own VitaMix). "We use our VitaMix to no end! We just love it so much, we are on our second one. The first one lasted more than 7 years, but when it went, we knew we had to have another one. "It has helped us with our son's Gluten Free diet (he has Aspergers/Autism spectrum) and it just always amazes us at what we can do with it for health." "I can't tell you how much I LOVE my Vitamix! On average, I use it several times a day." Back to the top - The Best Blender is the Vitamix!